Navy ships and Air Force B-52 bombers fired a total of 27 cruise missiles at "selected air defense targets" in southern Iraq for about a 45-minute period beginning midmorning, the Pentagon told CNN. President Clinton ordered the mission and was expected to make a formal statement about it at 8 a.m. EDT Tuesday, officials said. The 23,000 U.S. forces in the Persian Gulf remained on "a very high state of alert," braced for "any possible response" from Iraq, officials said. In an address televised on Iraqi state-owned telvision, Saddam urged his troops to resist U.S. strikes and declaring the Western allies' "no-fly zones," which are off-limits to Iraqi military planes, to be null and void. 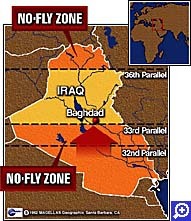 The speech came shortly after Britain announced that the "no-fly zone" in southern Iraq would be expanded to the north. 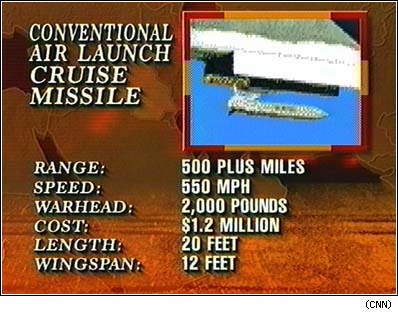 Saddam also claimed damage from the U.S. strikes was minimal and many missiles were downed. Saddam also claimed that the missiles struck civilian areas, causing high numbers of civilian casualties. But U.S. military sources told CNN that the missile attacks focused on air defense command and control facilities in relatively unpopulated areas of southern Iraq. Iraq's envoy in London condemned the U.S. attack as unjustified and said Iraq had the right to retaliate. "My government has condemned strongly this act of aggression," Ibrahim Zuhair, charge d'affaires in London, told Sky Television. "It's unjustified and we feel Iraq has the right to retaliate because we consider it unjustified, committed to terrorize the Iraqis." The Pentagon was waiting for damage assessment reports after disclosing the attack at 1:55 a.m. EDT, about 30 minutes after air raid sirens sounded in Baghdad. Hours earlier, Clinton signed off on military and economic sanctions against Iraq. The Pentagon initially indicated Baghdad targets were included, but later corrected that report. 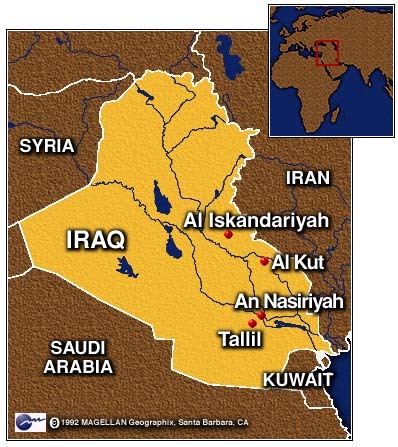 Sites in and around Al Kut, Al Iskandariyah, An Nasiriyah and Tallil were targeted, military officials said. Witnesses told Reuters that anti-aircraft fire was launched for a period from some positions in Baghdad. "The strike is over ... Every missile has been launched," said a Pentagon official, speaking on the condition of anonymity. But the Pentagon refused to rule out "the possibility of follow-on strikes" against the same or other targets. 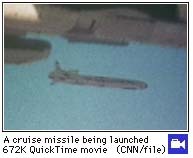 Fourteen of the missiles were launched by the Navy cruiser USS Shiloh and destroyer USS Laboon in the northern Persian Gulf, and 13 were launched by Air Force B-52 "Stratofortress" bombers that flew in from Guam, according to military sources who asked not to be named. Eight of the Navy's TLAMs were launched from the destroyer USS Laboon (DDG 58), and six were fired from the cruiser USS Shiloh (CG 68). The 13 ACLMs were deployed from Air Force B- 52 bombers. Britain provided logistical support for the operation, as U.S. B-52s flying to the Persian Gulf from Guam refueled at a base in the Indian Ocean, said Britain Defense Secretary Michael Portillo. Shortly before the air strikes, the United States and Britain advised all of their citizens to leave Iraq immediately. Republican presidential candidate Bob Dole issued a statement, praising U.S. troops and pushing for "decisive action" against Saddam. "America and its allies and friends around the world can no longer tolerate Saddam's repeated attempts to erode the restraints that have been placed on his regime, and to violently reassert his authority," Dole said. 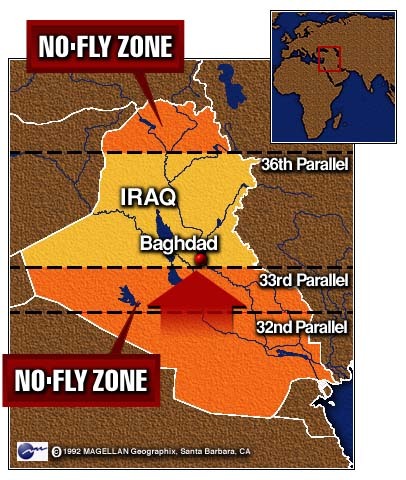 Allies expanding southern "no-fly zone"
In another disciplinary gesture toward Baghdad, Britain reported that the southern "no-fly zone" would expand north from the 32nd parallel to the 33rd, effective Wednesday. The change will allow allied planes to fly within 30 miles of Baghdad. The southern zone, like its counterpart in the north, is patrolled by British, French and U.S. aircraft. No extra aircraft are expected to be required. The safe haven in northern Iraq, which aims to protect Kurds and which was also set up at the end of the Gulf War in 1991, remains unaffected, British foreign office officials said. The strikes followed a White House report that it had evidence Saddam's troops were moving toward the Kurdish stronghold of Sulaimaniya in northern Iraq. Iraqi Deputy Prime Minister Tareq Aziz denied the White House claims, and said in the official Iraqi News Agency that Iraqi troops would withdraw Tuesday to the positions they held before Friday's assault. Iraqi forces were apparently trying to consolidate the positions of pro-Saddam Kurdish troops against those Kurdish groups opposed to Iraq, said White House press secretary Mike McCurry. U.N. officials reported Iraq had withdrawn from the Kurdish city of Irbil in northern Iraq two days after routing the Patriotic Union of Kurdistan (PUK) and installing the pro- Iraqi Kurdistan Democratic Party (KDP). But McCurry said Monday the Iraqis, despite U.S. warnings, were showing no signs of engaging in any militarily significant withdrawal from Irbil. "Our interest is in keeping Saddam Hussein from believing that unjustifiable behavior of this nature is cost-free,' McCurry said. Iraqi troops in Irbil have executed Kurdish opponents, and there were "extensive" casualties, he said. Military intelligence indicated three divisions of Iraqi troops remained outside Irbil, north of the 36th parallel that designates the Iraqi "no-fly zone" marked off by the U.S., France, Britain and the United Nations, said McCurry. The offensive, the first by Iraq since shortly after the end of the 1991 war, involved 30,000 to 40,000 Republican Guard troops equipped with heavy artillery and surface-to-air missiles, officials said. In justifying its weekend attack, Iraq accused the PUK of cooperating with Baghdad's long-time enemy Iran. The White House said U.N. Security Council resolutions approved after the 1991 war provided the legal basis for responding to Saddam's actions. Gen. John Shalikashvili, chairman of the Joint Chiefs of Staff, made urgent trips to Saudi Arabia, Jordan and Egypt to rally Arab support for a U.S. military strike. Saudi Arabia agreed to cooperate in any U.S. retaliatory action, Saudi sources told The Associated Press on condition of anonymity. Jordan said it declined to support military operations. Egypt declined to comment. Correspondents John Holliman, Claire Shipman, Wolf Blitzer, Peter Arnett and Jamie McIntyre, The Associated Press and Reuters contributed to this report.